Pascack Valley Real Estate! River Vale Real Estate! Outstanding & Spacious 3 Bedroom Brick Ranch w/ very generous room sizes & beautiful hardwood floors! 551 Cleveland Avenue in River Vale ($399,950!) boasts a large Living Room that opens to the spacious eat in Kitchen w/ door to the huge deck and private rear yard..Lovely Master bedroom, 2 additional bedrooms..Updated Main Bath..Lower Level has an exercise area and a very spacious Recreation Room w/ access to the attached one car garage..This home is located in close proximity to the picturesque town center and Roberge Elementary School.. Outstanding Value..light and bright home..Top Rated Schools..EZ NYC Commute by Car, bus and rail..Enjoy River Vale's outstanding Library, and Farmer's Market..A Wonderful Place to Live! Looking for more River Vale Real Estate? Browse through my Feature Homes! 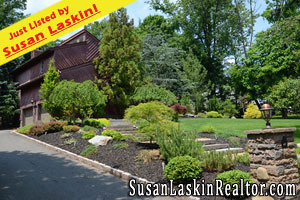 Some spectacular listings across the incredible Bergen County towns! Expanded Colonial in River Vale, NJ! Bergen County Real Estate! River Vale NJ Real Estate! Incredible location in the wonderful Pascack Valley region of Bergen County, New Jersey! Expanded Colonial w/ hardwood floors on each Level. 558 Wittich Terrace in River Vale ($522,950!) is set on a flat & spectacular 116 x 191 property boasting the ever pivotal "wow, factor." Family Rm/Dining Room expansion w/ cathedral ceiling & wall of French Doors that leads to the deck & magnificent rear yard. Large Main Level Living Room w/Bay Window. Front to Back Dining Room/Family Rm/French doors..Eat in Kitchen, Bedroom, Den and Full Bath..Upper Level has Four Bedrooms (yes..all with hardwood floors)..and a Bath (SS)..Central A/C..Gas heat..Recessed Lighting..Updated Windows..Master BR with Wall of Closets..Laundry Closet Main Level..original owner..Covered Front Porch..2 car garage..AMAZING VALUE! Opportunity of a Lifetime in River Vale! 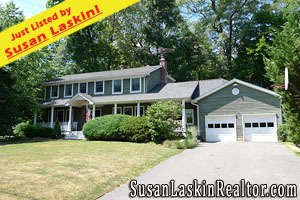 575 Brook Avenue in River Vale ($948,950!) is an exquisite Center Hall Colonial located on a approximately 1.4 acres of magnificence including a wonderful rear yard & pond views. Three magnificent levels living w/ immense daylight lower level. Incredible upscale features throughout. Large Center Island Kitchen has Triple Bay Window Breakfast Area. Great Room has Cathedral Ceiling & Fireplace. Vaulted Ceiling Library w/ Custom Library Shelving & French Doors. Banquet Sized Formal Dining Room..Living Room..5th BR(Guest Rm) Main Level/Full Bath..Light and Bright Upper Gallery with Palladian Window..Master Suite/MBth and 3 Addtional Bedrooms(all with hardwood) & Full Bath..Daylight Lower Level has a Gym, large Media Room, a Pool Room, and Outside Entry. Amazing Life Style! Looking for more River Vale NJ Real Estate? Browse through my Feature Homes! Some spectacular listings across the incredible Bergen County towns! California Magnificence Meets New Jersey Sophistication!! River Vale NJ Real Estate! Pascack Valley Real Estate! 734 Beechcrest Drive in River Vale ($938,950!) 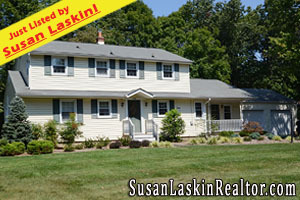 is an Exquisite Colonial w/ East/West exposure hidden away on a sought after cul de sac location! Amazing Front & Rear yard with built in Hot Tub, Waterfall & Extensive Artistic Pavers which sets the tone for an incredible life style! 2 Story Entry Foyer. 2 Story Great Room. 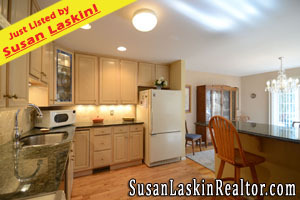 Updated Kitchen w/ Granite & Breakfast Bar overlooking Family Room and Private Property. Huge Master Suite that boasts clearstory windows, a cathedral ceiling, two story dressing room and a huge Master Bath. 3 Additional Spacious Bedrooms and updated Main Bath. Lower Level is an additional Full Living Space w/ 2 Offices, a beverage area, a full Bath w/ stall shower and a huge Rec Room. The setting is just remarkable! You will never leave this private hideaway!! Remarkable Colonial in River Vale! Wonderful Opportunity! 145 Geiger Drive in River Vale ($728,950!) is an outstanding 4 Bedroom Colonial in an incredible location that backs up to a picturesque & protected wooded property. In magnificent condition, this home boasts a two story Entry Foyer, an open flow to the Dining Room & Living Room and a lovely Kitchen w/ a Breakfast Room that overlooks the wonderful Deck & Private Rear Yard. There is a Family Room off the Kitchen w/ gas fireplace, a Powder Room and large Laundry Room at this level. The huge Master Suite boasts Architectural Ceiling, large Palladian Window and 2 Walk in Closets while the spacious Master Bath has a Whirlpool & Stall Shower. There are 3 additional Bedrooms and a Full Bath. This home is located in a beautiful community of wonderful homes..close to the town center..River Vale, a sought after community, is known for its top rated schools and excellent library..EZ NYC commute by Car, Bus and Rail! This is a home to be cherished! Looking for more River Vale NJ Real Estate? Browse through my Feature Homes! Some incredible listings across the wonderful Pascack Valley towns! 7 Bradshaw Court in Hillsdale ($498,950!) is a wonderful young townhome that was custom built to the specifications of this owner! Very light and bright, with a wall of windows and doors overlooks the magnificent large open green.. Magnificent open floor plan. Updated Kitchen w/ granite counters & breakfast bar opens to Dining Room..Large Living Room..Updated Powder Room on Main Level..Exquisite Master Suite with archetectural ceilings..Palladian Window. Updated Master Bath w/ whirlpool, undermount sink, granite & stall shower..walk in closet.. there are also two very spacious bedrooms both w/ hardwood floors & double closets. Updated Main Bath with undermount sink & stone counters..Laundry closet at bedroom level..Large Basement Ready to be finished..2 car attached garage. Looking for more Hillsdale NJ Real Estate? Browse through my Feature Homes! Some incredible listings across the magnificent Bergen County towns! Hillsdale NJ Real Estate - November 2011 Market Report! Hillsdale NJ Real Estate! Bergen County Real Estate! Hillsdale, New Jersey saw the sale of 3 homes during November 2011. The average List Price was $545,967. The average Sold Price was $492,000. The median Sold Price was $405,000. On average, homes that sold in Hillsdale, New Jersey during November 2011 sold for 90.12% of the List Price. In addition, there were 9 Hillsdale homes Under Contract at the end of November 2011. The average List Price was $405,967. 517 Rehill Court in River Vale, New Jersey ($848,950!) is an outstanding Custom Center Hall Colonial located on a large cul de sac of beautiful homes! Expanded, updated & wonderful w/ exception curb appeal! Covered & columned front porch.. large vaulted ceiling breakfast room addition with skylights off kitchen w/ breakfast bar..open & inviting..oversized front to back living room with windows overlooking front porch & large rear yard..large family room with fireplace & beautiful high doors leading to picturesque rear yard and i/g pool,formal dr..large laundry room of kitchen..3.5 updated beautiful baths..Romantic Master Suite w/immense walk-in closet & updated Mstr Bath, 3 additional Bedrooms(one w/sleep loft), & full updated bath..Basement is finished with inviting rec room, a home office/guest room & full bath(ss) and lots of storage..wonderful rear yard with i/g pool and lots of grassy area for recreation. The Township of Washington, New Jersey saw the sale of 8 homes during November 2009. The average List Price was $467,675. The average Sold Price was $445,375. The median Sold Price was $457,500. On average, homes that sold in the Township of Washington NJ during November of this year sold for 95.23% of the List Price. In addition, there were 4 homes Under Contract in this town at the end of Nov '09. Their average List Price was $576,450. Compare these numbers to what happened last month! 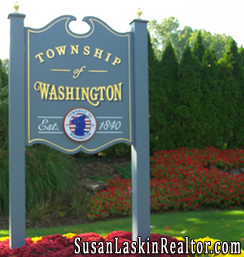 Learn more about The Township of Washington NJ Real Estate! Browse through my Featured Listings! Some incredible homes across the wonderful Bergen County, New Jersey towns!